It is with great pride to present this Annual Report of the Provincial Government of Bohol for Calendar year 2007 to our constituents, partners and stakeholders. 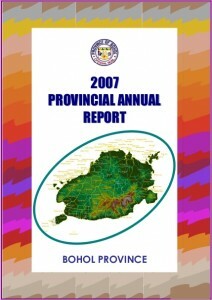 This Annual Report highlights the accomplishments of the departments and units of the Provincial Government for CY 2007. Our constituents, partners and stakeholders are no doubt familiar with our development framework, notably our Vision and Mission, geared towards eco-cultural tourism and agro-industrialization, our Program Framework for Poverty Reduction, and our continuing efforts to address the Millennium Development and National Development Goals. At this point, we are pround to highlight a new addition to our development framework: our 10-point development agenda, dubbed “10 in 2010”. Our focus on poverty reduction has not changed, for the battle against poverty is a constant one, and we should never let our guard down. However, we recognize that to fully address the goal of poverty reduction, we must also achieve economic growth for our constituents. We continue to build alliances within the Province: building bridges instead of walls. 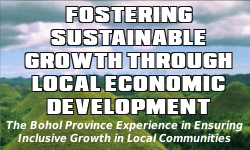 The previous years’ gains have shown how productive this strategy is, and we are pleased by the effectiveness of pro-active collaboration and partnership-building; not just with LGU and other public officials, but with the various development sectors and stakeholders of the province. Our theme of building alliances extends beyond the borders of the Province. We value our partnerships with Official Development Assistance (ODA) agencies and other international institutions, and we will sustain and expand these partnerships. Our theme of building alliances is equally relevant in our efforts towards sustained peace and development. As has often been said, development is impossible without peace, and peace is meaningless without development. It is the environment of peace that complements our efforts to bring in tourists, visitors, and investors into the Province. This Annual Report, in its Executive Summary, follows the format prescribed by the Department of the Interior and Local Government (DILG), subdividing accomplishments into three major parts: The State of Performance, The State of Productivity, and The State of Development. The detailed section of the report, however, follows the generally-accepted sectoral classification of the National Economic Development Authority (NEDA), as follows: Development Administration, Social Development, Economic Development, Environment Management, and Infrastructure Development. While it is indeed extremely gratifying to look back on the past year’s accomplishments, we also stress that Boholanos are not content to mull over past glories: we continually explore possibilities for development and growth. Frankly, we are very optimistic about our forthcoming major infrastructure and development projects, most notably the Panglao Bohol International Airport Project (set to start construction this year), the Bohol Circumferential Road Improvement Project (BCRIP) Phase III, the Bohol Tourism Road Improvement Project (Bohol TRIP), the Bohol Skills Trainings Advocating Reliance and Self-Employment Project (Bohol STARS), and many others that we have programmed for Bohol. Therefore, while we recognize and celebrate the accomplishments of the past year, we continue to work hard for the development of Bohol and the betterment of all Boholanos. Persistent hard work is a trademark of the Boholano, and it is one that aptly characterizes the Provincial Government of Bohol, represented by your humble Governor.